Church of the Divine Spirit - Who was Feathered Serpent? Quetzalcóatl ( Feathered Serpent ) was one of the most important gods in ancient Mesoamerica. Feathered Serpent was described as a white man, with a beard, who wore long robes, and who gave a message of love, forbidding the blood sacrifice, teaching of the One Supreme God, and giving many material things such as the calendar. 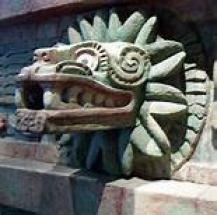 Feathered Serpent was worshiped since the time of the Olmecs.He was also known as Kukulkán to the Maya, Gucumatz to the Quiché of Guatemala, and Ehecatl to the Huastecs of the Gulf Coast. He was regarded as the god of winds and rain and as the creator of the world and mankind. In Central Mexico from 1200 CE he was also considered the patron god of priests and merchants and considered the god of learning, science, agriculture, crafts and the arts. He invented the calendar, was identified with Venus, the rising morning star, he was associated with opossums and even discovered corn (maize) with the help of giant red ant that led him to a mountain packed full of grain and seeds. His birth was unusual; it was a virgin birth, to the goddess Coatlicue. He left the culture because of the persecution of powerful religious leaders, but promised one day to return, as he had left, from the East, over the ocean. Before he left he buried his heart under the El Tule Tree in Oaxaca, Mexico and promised to reclaim it when he returned. This "return" has been explained as not necessarily a return of the same physical being, but the return of the same Spiritual Message coming from another Great Prophet. The conquistadors and the Spanish priests had a much easier time than expected converting the Aztec and the Maya because of the many similarities between the figures of Jesus Christ and the Mesoamerican god, Feathered Serpent. Quetzalcoatl. It is claimed that these similarities facilitated conversion because the Aztec and Maya saw belief in Jesus as an extension of things they already knew as opposed to a complete diversion from their traditional beliefs. To many of the Mesoamericans, Quetzalcoatl was a feathered serpent god who played a critical role in the creation of mankind as well as in daily life. A juxtaposition of Quetzalcoatl and Jesus Christ has revealed the following similarities: a deity playing a large role in the creation of mankind, a deity being a transgressor between earth and sky, a deity associated with the bread of life, a deity assisting the dead, a deity shedding his own blood to save the fate of mankind, a deity dying on a tree, a deity resurrecting and playing a role in the rebirth of the deceased, a deity who is associated with light and the sun, and more. Like Christ, He represented our own I AM Presence…our God selves. Like Christ, he strikes down the Prince of Darkness and Evil (Tezcatlipoca), who attempts to deceive mankind. Both preached a message of Love. Jesus, identifies himself with the serpent Moses raised up, Feathered Serpent is identified with the serpent, a relationship reflected at Kukulkan’s temple at Chichen Itza. Both Christ and Feathered Serpent were recognized as creator of things. Both Christ and Feathered were born of virgins. Both Christ and Feathered Serpent are described as being light skinned, wearing a beard and wearing a white robe. Both Christ and Feathered Serpent performed miracles. Both Christ and Feathered Serpent taught the ordinance of baptism. Both Christ and Feathered Serpent prophesied of future events. Both Christ and Feathered Serpent sent out disciples to preach their word. Both Christ and Feathered Serpent promised they would come a second time. A new star is associated with both Christ and Feathered Serpent. The children of both Christ and Feathered Serpent will become lords and heirs of the earth. “One of the incarnations of Quetzelcoatl is buried beneath the roots of the sacred El Tule Tree near Oaxaca, and as the first rays of the dawning sun of the new heaven cycle [August 17, 1987] sink into the depths of the Earth, billions of tiny spirits will burst from the heart of Quetzelcoatl. The Western Traditions of Judeo-Christianity would view the Return of Feathered Serpent to the El Tule Tree to reclaim his heart and bring love and peace to the World in terms of the Sacred Heart of Jesus. The event would be viewed as the Spirit of Jesus Christ returned to the El Tule Tree on August 16 1987 and Christ reclaimed his Sacred Heart. In 1987 the sacred heart of Christ burst open activating Christ Consciousness within the hearts and minds of every human, animal mineral and plant. The Energy of Christ began to feed the El Tulle Tree’s root system and flowed into all the Earth Chakras and Crystalline Grid of Inner Earth. Mother Earth Chakra system began to operate as an integrated system of Christ Consciousness Energy . This new energy will not only affect people but also nations. This is part of the 7th Planetary Gateway's Mission, to develop inner balance and androgyny or the inner balancing of yin and yang forces for all living beings. The energy from this Leyline balances the Earth's Northern Hemisphere (yang, or masculine energy) and the Southern Hemisphere (yin, or feminine energy). Furthermore, this energy will influence the balance in world power. The energy has empowered the wave field in the Tex-Mex geographic area of the "Head of the Dove' . This wave field contains the energy to fulfill the Hopi prophecy of the Eagle and the Condor. The "Prophecy of the Condor and Eagle" says that the Condor and the Eagle will have the opportunity to reunite and fly together in the same sky, along the same path. If the Condor and Eagle accept this opportunity, they will create a most remarkable offspring, "The Return of the Dove" . The Prophecy of the Condor and Eagle has interpreted as the vision of a new age where there is a balancing of yin and yang, and merging of northern and southern cultures. The Eagle represents the highly developed technological world. The Eagle has sacrificed their heart or spiritually (female ) in favor of material wealth and knowledge(Male). The people of the Condor represent the indigenous people of the world living close to mother nature, with a well developed spiritual and heart (female energy). These people are spiritually rich but materially impoverished. The modern world is moving into their environment and threatening their way of life.. They must understand and develop some of the intellectual skills of the Eagle. According to the prophecy of the Eagle and Condor, we are at the beginning of the "Fifth Pachacuti", a time of partnership, love and healing, and a transition out of an era of conflict and turmoil into more sustainable and earth-honoring ways. We will see the Eagle and the Condor flying together through the "Star Codes" being brought in thorough the Planetary Gateway and Feathered Serpent Leyline.